1 of 2 Mix together goat cheese, rosemary and pepper. Roll into thirty-six 3/4-inch balls. Slice both beets and hearts of palm into 36 pieces. 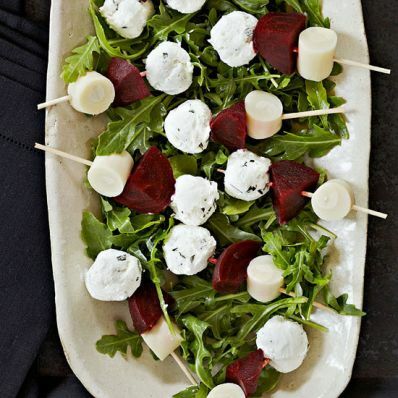 2 of 2 Place 1 goat cheese ball, 1 piece of beet and 1 piece of hearts of palm on each skewer. If desired, arrange skewers on a bed of arugula. Per Serving: 75 mg sodium, 0 g fiber, 2 g pro., 23 kcal cal., 1 g Fat, total, 1 g carb., 1 g sat. fat, 3 mg chol.